The humble bee is being put to work. But they aren't just making honey; they are busy being trained to sniff out drugs and explosives. 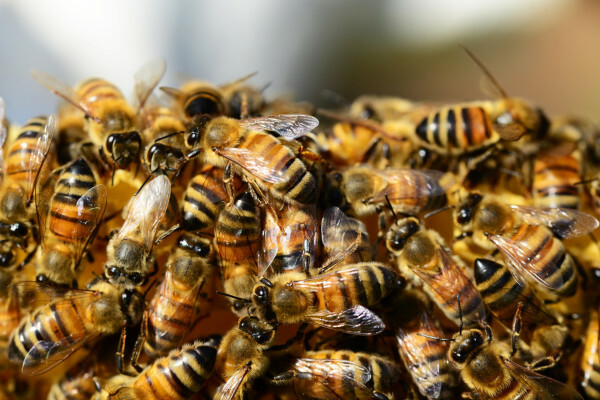 By becoming 'sniffer bees', the honeybee, Apis mellifera, could soon be Britain's answer to combating national security threats and drug smuggling. Honeybees have an acute olfactory sense, which can be thought of as a very sensitive sense of smell. By training the bees to associate an odour with a reward, scientists are able to train the bees to detect almost any odour. This technology, which has been developed by Inscentinel Ltd., a small spin-out company based at Rothamsted Research in Harpenden, has a variety of potential applications, including the detection of illegal drugs and explosives in airport security and the military, as well as in medical diagnostics and food quality control. "Bees are at least as good as sniffer dogs but are cheaper and faster to train, and available in much larger numbers. It is dependent on the specific odour, but bees can detect some odours that are present in parts per trillion - that's equivalent to detecting a grain of salt in an Olympic-sized swimming pool," says Dr Nesbit, a research scientist at Inscentinel Ltd.
Honeybees have the ability to learn and memorise. The bees are loaded onto individual holders where they sit comfortably whilst exposed to an odour which is passed over them in short pulses. Whilst exposed to the odour, the bees are simultaneously rewarded with a small drop of sugar syrup, which the bees stick their proboscis (tongue) out to receive. This is a classical Pavlovian conditioning method. Once conditioned, if the bees pick up the odour they've been trained to detect, they stick their probosces out in anticipation of the syrup, before the syrup is offered. This proboscis extension reflex is the signal that the scientists use to determine successful conditioning. It takes between two and eight rounds of training which is completed in just a few hours, with the reflex lasting for several days. Once trained, up to 36 bees are loaded into a handheld sensing device. The bees can be trained to detect the same odour, or smaller groups of bees can be trained to detect different odours within the same device. The bees are exposed to a constant stream of clean, filtered air until a sample of air from an area requiring testing is sucked into the machine. An optical sensor records any bees extending their proboscis, which is then interpreted by software. Based on a statistical population of bees, a simple odour present/absent response follows. The whole detection process takes around six seconds. The bees are not harmed whilst performing their sniffing duties; the health and comfort of the bees dictates the performance of the sensing device. Each bee works for a maximum of a two-day shift before it is returned, healthy and unharmed, to the hive, to enjoy the rest of its life working for its colony. Nesbit explained that the bees have potential uses in other fields as well as national security: "We are currently involved with a project commissioned by a fruit juice factory who wants to use the bees to detect if the oranges they buy for juicing are infested with storage pests. Alternatively, the bees can also be used in medical diagnostics" she said. Nesbit explained that as some diseases are linked to a specific odour being released in the urine, blood or breath, the bees can be used as a method of detection, producing a medical diagnosis. How do you rid a car of a fart?